I believe any food can be made delicious with the right treatment, but I’ve had a hard time warming up to squashes. Too often, I’ve served them because they’re so good for us but my sister-in-law showed me the error of my ways. This little side dish of zucchini and yellow squash is absolutely scrumptious! I’m still getting mileage from my recent trip to Georgia over the Holidays! Mental mileage as I juxtapose images of warmth and pleasant walks with the dogs over the image of the frozen tundra outside my window here in Minnesota. I’m also still getting some mileage from the food made by my talented sister in law! Every time I make this, I’ll think of my trip and how much fun it was to see family. 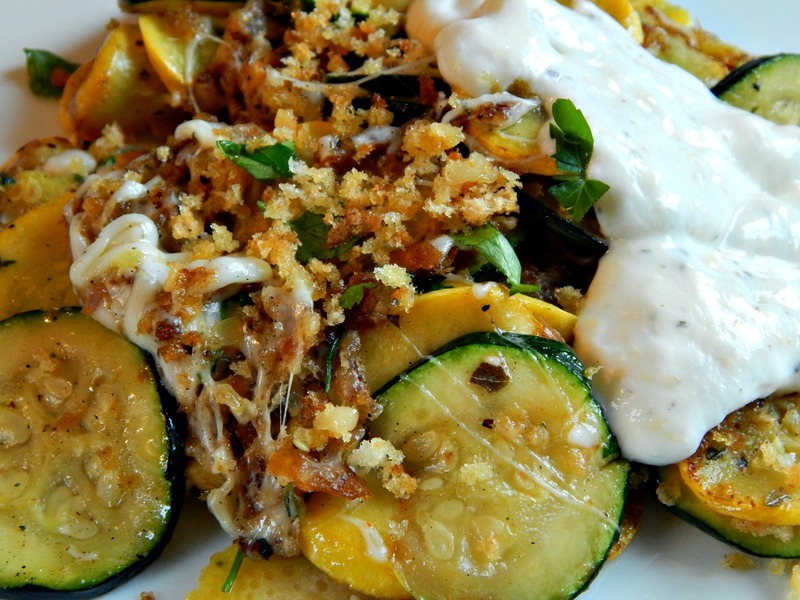 This dish, a mixture of yellow squash and zucchini, is a bit like an infomercial! I keep thinking, “But wait, there’s more!” as I make it. Gorgeously seasoned and sautéed the squash is excellent served up plainly. Summer Squashes with Herbed Bread Crumbs. Add in a few toasted bread crumbs and a little lemon and it’s even better. A little sprinkle of cheese stirred in when it’s done and its heaven. A simple sauce of yogurt, lemon and herbs takes it completely over the top. Fairly quick to make, this took about 15 minutes. Herbed Bread Crumbs – a great way to introduce someone to a squash! So choose your elements, the squash, bread crumbs, cheese & sauce, and combine as you wish with what fits your diet, and eat your squash. It’s good for you! 🙂 And try not to lick your plate, especially if you’re not alone! Add one tablespoon olive oil to a saute pan, heat and add in bread crumbs. Cook, stirring until bread crumbs are lightly browned and crunchy. Stir in parsley, if desired. Remove from pan and set aside. Add the additional tablespoon of oil to the pan, then the squashes. Saute until softened and slightly brown around the edges, stirring frequently, several minutes. A moment or two before the zucchini is finished, add lemon strips, garlic and seasonings to taste. When the squash is finished, turn off heat and toss with the breadcrumbs, stirring until well incorporated. If using cheese, turn off heat and add the cheese to the skillet, tossing until melted and incorporated. Serve immediately with yogurt sauce. Mix ingredients together, taste and adjust seasonings as desired. This entry was posted in Click here for Bargain Meals, Click here for Fabulous Food Posts and tagged breadcrumbs, Cheese, Easy Recipe, Lemon, Side, Squash, Summer Squash, Vegetable Side, Vegetarian Meal, Yogurt, Zucchini. Bookmark the permalink. I warm up to squash anytime and these look soooo good! 🙂 I will, now! And I’m thinking of other vegetables that might benefit from this treatment! The whole concept of a yogurt sauce on veggies was new to me, and I really love the idea – that’s part of why it’s so much fun to hang out with other cooks! Thanks for the photo comment – I think mine are starting to look a little better, sometimes!! I had a sneaking suspicion you might like the yogurt sauce! This looks delicious. I’ll certainly take a stab of this sometime in the future. Cheers! What I liked is that is was so different from anything I’ve ever had! man, this looks goooood. I’d add in all those options, then maybe end with a sprinkle of fetta coz #cheeseFreak. Loving those crunchy breadcrumbs. And the yogurt sauce. And… all of it, really! I tell ya Mum, my sis-in-law is a genius in the kitchen. Feta would be excellent on this! It looks yummy….like the thought of a yogurt dressing. I’ve only started eating zucchini (as a veg) in a last few years. Previously it was always baked in a loaf or cupcakes. Th young ones, I just cube up and stick into chilis/ soups/ baked in the oven (in oil/sugar/spices) Also like them cut up small in tossed salads. Older and larger zucchinis, I would deseed first..then use as above. Those are great ideas! I bet they almost dissolve into the chili. My mom used to make a zucchini soup – it was kind of brothy with cubes of beef. I’m inspired now to look for that recipe and make it again! Other than adding baked acorn or butternut squashes to soup and then pureeing the whole thing, I don’t eat them at all. Maybe one day, I’ll find a way of enjoying them. I’ve only had zucchini once that I liked it … dipped in an Indian spiced batter and deep fried. I think the first zucchini I had was deep fried in tempura batter, but the spices sound lovely, too. You might want to consider giving this a go – it converted me.